JMS was engaged to oversee the salvage and survey of DUCK NO.34 which was sunk in the Delaware River tragically killing two passengers. DUCK NO.34 is a WWII amphibious landing vehicle (DUKW) which has been converted to a passenger vessel and used to conduct popular tours through the streets of Philadelphia and in the water off of Penn’s Landing. The DUKW was carrying 35 passengers and two crew and was anchored on the edge of the shipping lane after its motor failed during the water portion of the tour. It was struck by a 250-foot-long barge being pushed by a tug, spilling the passengers into the river and rapidly sinking. 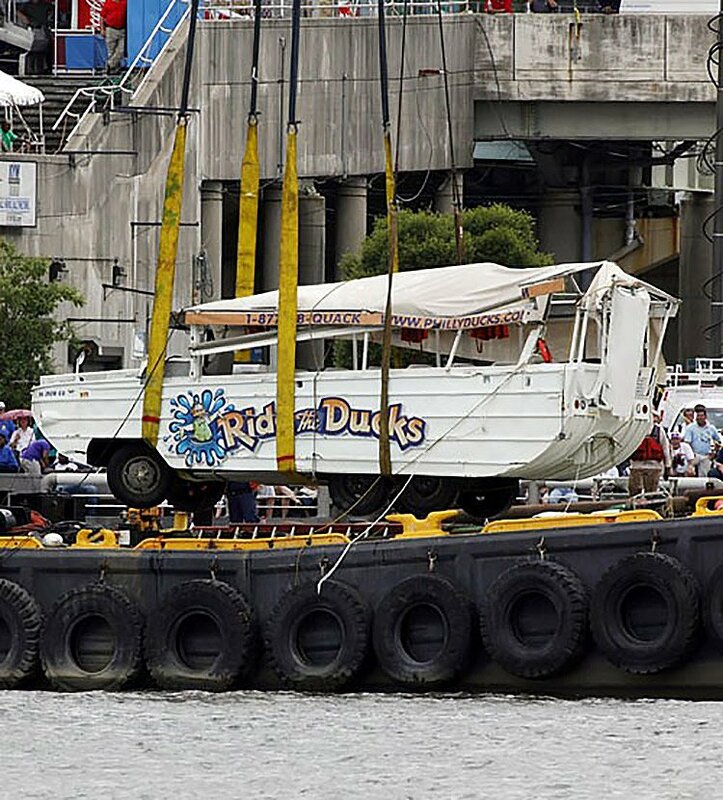 JMS provided an on-site salvage engineer to work with the owners, Ride the Ducks Inc. (RTDI), the National Transportation Safety Board, and the US Coast Guard to rapidly develop a salvage plan. Upon JMS’s recommendation, Weeks Marine was engaged to provide lifting, diving and underwater video services. Weeks Crane Barge NO.573 was loaded with appropriate diving and rigging gear and departed Weeks’ Camden Facility. The 573 was moved by Hayes Towing and spudded-in over the wreck off of Penns’ Landing to facilitate diving, rigging and lifting as per the approved mooring plan. JMS consulted with the divers, Salvage Master and RTDI principals on-scene throughout the salvage operation. The salvage consisted of a simple lift with divers rigging slings so a barge mounted crane could lift the DUKW onto a deck barge. Once the vessel was raised, JMS conducted a thorough damage survey to be used in the subsequent investigation and litigation.